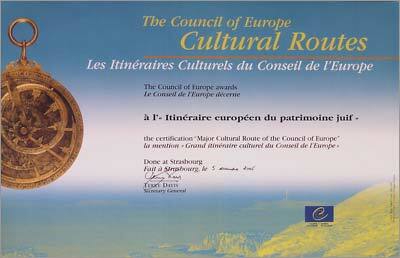 The Slovak Jewish Heritage Route is associated with the European Routes of Jewish Heritage network, which is has been awarded the status "Grand Cultural Route“ by the Council of Europe. The European Routes of Jewish Heritage have been promoted by an alliance of several Jewish and non-Jewish organisations, including tourist agencies as well as volunteer organisations. It is a unique example of putting together experiences from many walks of life for a common goal shared by all: the preservation and the promotion of Jewish heritage as a European heritage. The European Routes of Jewish Heritage focuses on the pedagogic aspects of discovering Europe's rich heritage and will particularly target young people.